A saltwater pool uses a salt chlorine generator. This means that instead of adding chlorine to the pool water, you add salt, and the generator converts it to chlorine. It’s called a saltwater pool because you add salt to the water at a level high enough to allow the machine to function, which also makes the water feel silkier. The salt taste is very mild and actually enjoyable. It would need to be around 5,000 ppm (parts per million) to be bad, and the range for a salt chlorinator in a pool is generally 3,000-4,000 ppm. For these pools, the “salt water” is about 1/10 the salinity level of the ocean—it’s more like a teardrop or contact lens solution. If you’ve ever wanted to know what it would feel like to swim in a pool of your own tears, now’s your chance. What should I know about salt water pools? You add salt to your pool water, and the salt chlorine generator converts it to chlorine (hypochlorous acid). You should use salt that's 99% pure or higher. Salt chlorine generators typically cost $1,700–$2,500 upfront and last about 3–7 years. They're easy to maintain, keep the water clear, and annually cost less than traditional chlorine. What is a salt chlorine generator? The machine has two primary components: the cell and the control board. The pool water flows through the cell. Inside, a series of metallic grids with a low-voltage current create a reaction that converts the salt down to tiny little bubbles of pure chlorine. After leaving the chlorinator, this pure chlorine reacts with the water to form hypochlorous acid, which is your end goal. Pool people’s references to “chlorine” are pretty loose, by the way. There’s all kinds of chlorine variants you can add to the water upfront, but when all the chemistry’s said and done, what’s cleaning your pool water is actually hypochlorous acid, not pure chlorine. Ground zero for this chemistry is plain ol’ water in the pool and your chlorine additive. Many people use liquid chlorine (sodium hypochlorite) or solid chlorine compressed with cyanuric acid (granular or in tablets). In the case of a salt chlorine generator, you use salt (NaCl). 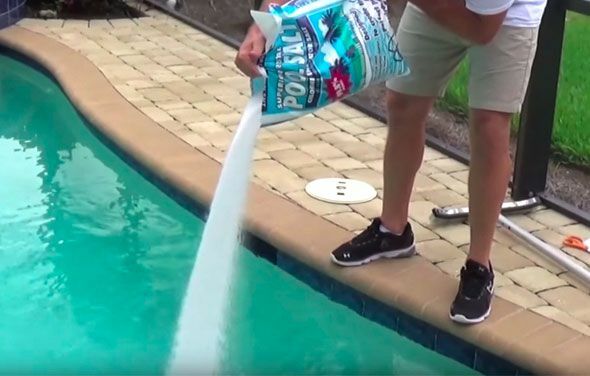 After you pour that additive into the water and mix it all up, it goes through two different chemical reactions before it reaches the form that will kill algae and bacteria and destroy dirt (the hypochlorous acid). The first reaction is what the salt chlorine generator does for you. The second reaction is how the chlorine becomes hypochlorous acid and cleans the pool. First, the electrolysis of salt water produces pure chlorine. When electricity is passed through 2NaCl (salt) and 2H20 (water), the atoms dissociate into Cl2 (gaseous chlorine) + 2NaOH (sodium hydroxide) + H2 (hydrogen). The sodium hydroxide is happy to live its life now. It raises the pH of the water so it’s not too acidic. And the hydrogen is just a normal part of pool water (since pH measures hydrogen ions). However, the chlorine is still busy and moves on to the second reaction. Second, the pure chlorine reacts with more water and becomes hypochlorous acid. When the gaseous chlorine (Cl2) mixes with the water (H2O), the reaction leaves us with HOCl (hypochlorous acid) + HCl (hydrochloric acid). The hypochlorous acid is what kills algae and bacteria fast. It’s also what we measure when we test for “chlorine” in the water. The other product is hydrochloric acid, or muriatic acid. It lowers the pH of the water so it doesn’t become too basic. You can read more about the chemistry of pool chlorine here. What kind of salt does a salt chlorine generator use? Use salt that’s only intended for swimming pools, food-grade, granular, and non-iodized. The higher the salt purity, the less trouble it’ll give you in appearance and maintenance. We recommend 99% purity or higher. Don’t use rock salt (halite) in your pool. It isn’t pure enough, and it won’t dissolve well. It’ll just give you a headache. We also recommend you don’t use calcium chloride. Calcium affects the hardness of the water and can form deposits on your pool walls if the concentration is too high. How much salt does my pool need? The salt level should usually be 3,000–4,000 ppm, but check your cell’s rating. Some salt chlorine generators have different ranges. For a brand new pool, add 40–50 lb. of salt for every 2,000 gallons of water. For a pool that’s already done some duty with chemicals, test the water first. You can use a calculator or chart like this one to figure out how much salt you’ll need to add to reach the ideal ppm. 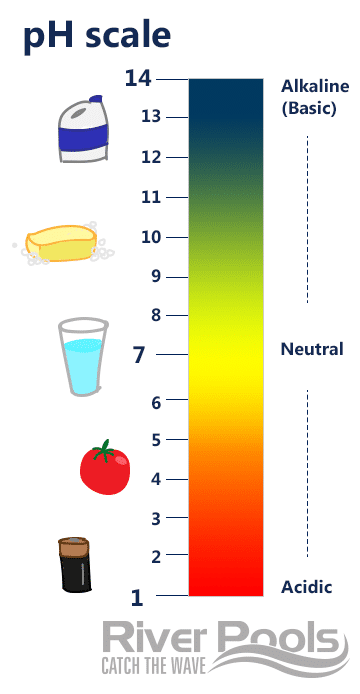 This chart provides extensive guidelines for balancing your water. How much does a salt chlorine generator cost? It usually costs $600–$2,000 to install a salt chlorine generator. It may seem like a lot upfront, but most folks feel it’s worth the initial investment because they don’t need to purchase chlorine from a pool store. A salt water pool typically costs $50–$100 per year to maintain. Compare this to traditional chlorine pools, which cost $250–$300 per year. Replacing the cell unit costs $700–$900 every 3–7 years. Taking all the expenses into account, using a salt chlorine generator in your pool costs about the same as traditional chlorine. How long does a salt chlorine generator last? The cell will typically last 3–7 years. Your salt levels and maintenance can have a big effect on how long it lives. Keep up with your maintenance to maximize the cell’s lifespan. Take care of your salt chlorine generator, and it’ll take care of you. What are the pros and cons of a salt pool? A salt water chlorinator keeps the water clear. The water feels silky smooth because of the salt. You don’t have to go to the pool store and lug around big buckets of chlorine. You don’t have to handle or smell the chlorine because the machine produces it for you. The chlorine doesn’t burn your eyes or smell when in the pool. It’s easier on your skin and eyes. You do have to shell out money to replace parts such as the cell. It can be easy to neglect the pool. Because the water stays clear and the chlorine level doesn’t burn your eyes or skin, the chlorine can creep up too high without you noticing or checking it. That can damage the pool or pool components because it’s hard on the equipment. Caution: Even if the chlorine is double or triple the amount it should be, it still won’t burn your eyes or make your skin itchy. Now, if it made it up to twenty times the correct amount, you’d notice. Painfully. But you can’t rely on “well, I didn’t get any chlorine burns today” as an accurate assessment. Do your maintenance and keep your water chemistry balanced. Does salt water work with automatic covers? Most people who work with automatic covers will cover a pool with a salt water system in their warranty. However, there are a lot of metal components, which salt water can damage, and they may be hard to replace. We recommend an inline erosion feeder (the standard chlorinator) if you have an automatic cover. Does a salt water system work with all pool types? A salt chlorine generator works best with fiberglass pools. It also works fine with vinyl liner pools with polymer wall panels and concrete pools with a tiled interior surface. Don’t use salt water systems in vinyl liner pools with metal wall panels. The salt will corrode the panels as well as any handrail and ladder anchors made with galvanized steel. Salt water is abrasive on the interior surface of a concrete/gunite pool, especially plaster. How Long Should Salt Water Chlorine Generators for Pools Last? If you decide that a salt water chlorinator is the best fit for you, you may want to look into fiberglass pools as an option. The surface doesn’t corrode or roughen with the salt, and the moderate initial price is offset by the minimal lifetime cost. We want to help you make the best decision, with all the information. You can look over the basics of fiberglass pools if you aren’t familiar with them and then compare all three pool types. River Pools is located in Virginia and manufactures fiberglass pools for distribution throughout North America. If you would like to find a dealer, or if you live in Virginia or Maryland and would like to talk to us about installing your pool, get in touch with us! We'd be thrilled to help you. Editor's note: This blog article was originally published in November 2017 and has been updated and revamped for accuracy and appearance.